New! The recommended websites for this book have been updated to include lots of new video clips and activities. Choose a topic to visit the recommended websites for this book. The activities may not exactly match those described in your book, because websites are changing all the time, but we hope you find these useful. Over 50 fun projects that fly, fling, spin, swim, whoosh, zoom and ooze plus over 500 stickers to decorate them. Colourfully illustrated with step-by-step instructions and short explanations of the science involved. Links to 50 websites with online experiments, games and activities. 2008 Winner of the Royal Society Prize for Science Books: Junior Prize. Big Book of Science things to make and do isn't just a craft book. All the activities are designed to demonstrate fundamental scientific concepts and bring them to life in an interesting way. The book is great fun so I'm not surprised that the young people judging the junior prize loved the book. It will appeal to young people of all ages and abilities. It's colourful, engaging and a really deserving winner. 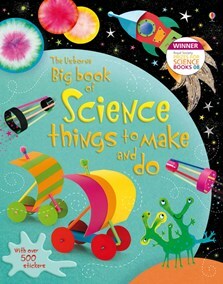 We reckon that The Usborne Big Book of Science Things to Make and Do should be congratulated on the skilful way it has inspired children with sciences and, at the same time created a marvelous craft book for children. Here are over fifty fantastically fun projects for children to enjoy doing with or without an adult that use easy-to-find everyday materials. Make things that fly, fling, spin, swim, whoosh, zoom and ooze, and discover the surprising science behind them. It's a great way to introduce children to the world of science in a practical and interactive way and hopefully to inspire them to continue science for longer as they progress through school. Will spark a real interest in science. An activity book with easy instructions for lots of fun and simple experiments like a spinning helicopter or magic flowers. Alongside these are explanations, internet links and most importantly 850 stickers to decorate the projects with. Eureka! This book is beyond amazing! As a home schooling mom of a 7 year old boy, I need to work hard to keep him interested and into the projects he is working on - and I do that with Usborne. This book is filled with tons of great activities, that will keep you busy for days. I loved making the cool activities. My favorite is baking the bread. It tasted very good. Perfect for young experimenter and neat-freak Mum alike. This is the best children's experiments / activity book I have seen! (I'm an Usborne Books at Home organiser, and an engineer.) The projects are interesting, very effective, quick to complete, and do not require too many obscure materials. My 5 year old can manage most of the projects with only minimum help, without covering half the kitchen with "experimental by products". (Known as "a lot of mess" to you and me ....) It's suitable for older children too - perhaps up to 9-10 years old. It's not a babyish book at all. My son and I toddled over to the bookstore on Thursday afternoon. Normally we'd have hit the library, but he wanted a book that was "MINE, and I NEVER have to give it back again". So we browsed around for an 'experiment' book. We hit on the Usborne Big Book of Science things to make and do" I must admit my partiality, having done selling for Usborne for 3 years while in Spain. But besides that, it really was the nicest illustrated and most appealing to a 4 year old. And most appealing to the mother, since all the experiments and things to make and do appeared to use stuff I had hanging around in the house. Well, since then we've been having a ball. Unlike the fiddly girl stuff in the girlie make and do books, all the stuff here only uses bits of cardboard or paper, elastic bands, sticky tape and straws! And they really work, and more importantly, the cool factor is really high. The cool factor is really really important to 4 year olds! We've done / made about 4 things now, and they really have only taken stuff I had in the house and they only take minutes to make. The kids should be in bed, but we've just made some great catapult paper aeroplanes, so they're having a wonderful time launching these into space!